Petersfield & Rey Group Limited and CASA de Ropa, operating under the government's flagship initiative, One-District-One- Factory (1D1F), have commenced production. The duo are operating from two different districts. While Petersfield & Rey Group Limited is operating from Ataabadze in the Komenda-Edna-Eguafo-Abirem (KEEA) Municipality and producing Reydrops natural mineral water, soft drinks and pure natural fruits (pineapple, watermelon and mixed fruits with ginger), that of CASA de Ropa is operating from Gomoa Bewadze in the Gomoa West District. CASA de Ropa uses sweet potato as its raw material to produce sugar-free nutritious bread and other mouth-watering tasty pastries. This came to the fore when the National Coordinator for 1D1F, Hon. Mrs. Gifty Ohene-Konadu, Wednesday, toured the two companies to ascertain for herself the level of progress of these companies and the challenges confronting them. At Petersfield & Rey Group Limited, Hon. Mrs. Ohene-Konadu was taken round the production site by the Production Manager, Julian Lomotey. The company, Mr. Lomotey explained, has two production lines, one producing bottled water and the other producing soft drinks and pure natural fruit juice. She was also introduced to another facility that produces sachet water. Mr. Lomotey told Hon. 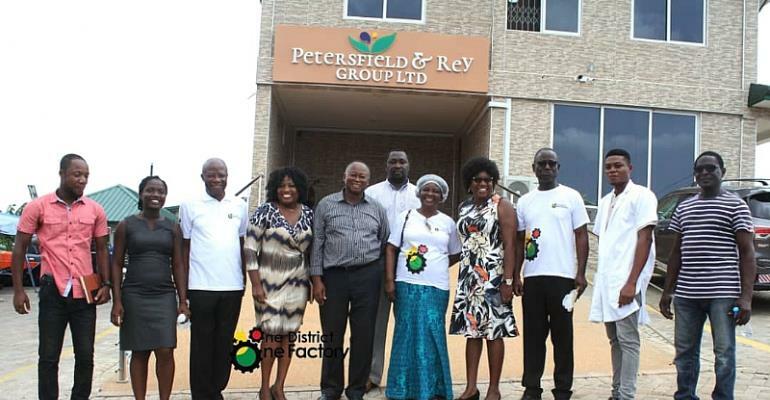 Mrs. Ohene-Konadu that Petersfield & Rey Group having entered the local market with Reydrops natural mineral water, is currently doing test runs on its soft drinks and pure natural fruit juice production line. He is confident that by end of March, 2019, Ghanaians will start enjoying pure natural fruit juice from the company. The 1D1F National Coordinator was also taken round a modern laboratory facility by Cynthia Amoah, a Food Scientist and Govina David, Quality Assurance Officer, where all products from Petersfield & Rey Group are tested to see if they meet the requirements of the Food and Drugs Authority before being released onto the local market. The Chief Operating Officer, Petersfield & Rey Group, Ama Abraham, in a short brief told Hon. Mrs. Ohene-Konadu that the company currently employs 65 people and is hopeful of doubling the number if they go into full production. It also has165 out-grower farmers also assisting in producing raw materials to feed the company. The company, she added, has its own farmlands of about 206 acres. She recounted some support the government under the 1D1F initiative, has been giving to the company. Key amongst them are GH₵6.75million loan facility secured from the EXIM Bank and the release of Extension Officers by the Ministry of Food and Agriculture to train the farmers on best agronomic practices and the types of seedlings to plant. In addition to that, the Ministry of Energy is assisting them with a 500kVA transformer to run the company. Further to that, the KEEA Municipal Assembly has assisted them in making the road to their farms motorable. At Gomoa Bewadze, Hon. Mrs. Ohene-Konadu was taken round the production site of CASA de Ropa by its Chief Executive Officer, Ebenezer Obeng Baffoe, the Technical Manager, Tony Dawson-Amoah and Programs & Innovation Manager, Joseph Okyere. The company has two facilities – a test-run center where it is currently producing in smaller quantities and the main production site which is about 85% complete and only awaiting to be roofed and get connected to the national grid. Installation of its plant machinery is also yet to be done but officials of the company say, all the machinery needed to run the company have been procured and warehoused. Hon. Mrs. Ohene-Konadu was also taken round the company's 760 acres farmland which they are developing with modern irrigation facilities and three dams to harvest rain water. Mr. Obeng Baffoe in a brief told the 1D1F National Coordinator that the company currently employs 154 people and hopes to engage about 1004 people when it goes into full production. They have also engaged 450 farmers who are cultivating the land to produce the raw materials to feed the company. Mr. Baffoe expressed the company's gratitude to the government for assisting them to secure a loan facility worth GH₵14million from the EXIM Bank to enable them put up the GH₵20million facility. Hon. Mrs. Ohene-Konadu in a brief remarks said she is much impressed with the progress of work done by the two companies. She was full of praise to the President, Nana Addo Dankwa Akufo-Addo for having the vision to boost the economic activities of the various districts in the country while reducing the creating employment avenues for the teeming unemployed youth. She challenged all the doubting Thomases to visit Petersfield & Rey Group Limited and CASA de Ropa and see the wonderful works they are doing.